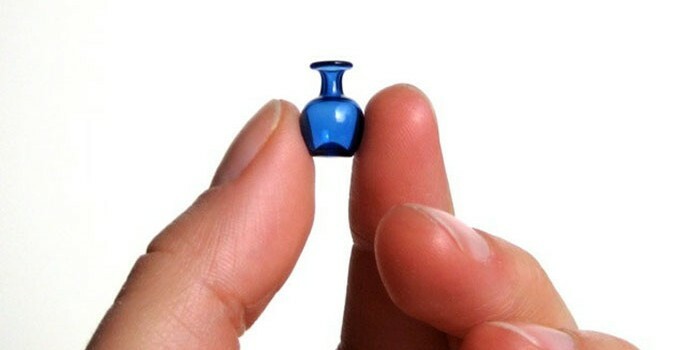 Miniature things are more adorable than their full-size counterparts. There’s no denying it. Miniatures also give me an excuse to collect lots of them, since they hardly take up any space; at least that’s what I tell my husband. It was extremely dangerous for me to research cute little things for this spotlight. These are the risks I take for you, dear reader. Silvia of Mijbil Creatures makes some of the tiniest treasures around from her work space in Lund, Sweden. I’m amazed at the level of detail she’s able to achieve on such itty-bitty works of art. She adds a grain of rice to her photos to help show the scale – now that’s little! The only thing cuter than a tiny kitten is an even tinier kitten. I simply died when I saw Silvia’s kitties on spoons. The cats are hand-painted after being sculpted out of polymer clay, and measure at just over a quarter of an inch in length. Now that’s crazy tiny! 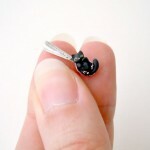 These micro meow-ers come in all different colors and can even be custom made. Silvia also specializes in elves, fairies, gnomes and pixies. 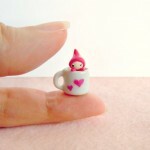 This adorable elf friend lives in a coffee mug tiny enough to be held on your fingertip. Other fantasy creatures come with their own treasury box. You can see many of her miniscule projects in the works, find free printables, tutorials, OOAK commissions and meet Elliot the Elephant (a little friend that keeps Silvia company on her adventures) on Silvia’s blog. Kiva Ford works as a scientific glass blower by day, creating custom glassware for research and discovery chemists. By night, his miniature creations take glass blowing to a new, micro level. Kiva’s Etsy shop has unique glass pieces for your home and your body. His shop also holds the distinction of having the worlds smallest Klein bottle! 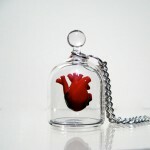 Now you can really give your heart away – this anatomical heart in a jar is ridiculously detailed for its small size. Complete with aorta, atria and ventricles, the entire piece is under two inches tall. The cardiac sculpture floats in the jar, attached in the rear with a transparent post. I’m staging an intervention with the citizens of Who-ville! For the true lightweight drinker, this miniature bottle and glass set will keep you sober enough to drive home. 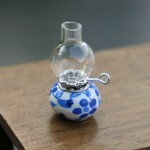 Hand blown from borosilicate glass, the set is as durable as it is adorable. 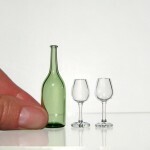 A great gift for any wine enthusiast or miniature collector. You can keep up with Kiva Ford on Facebook or visit his website to see his full portfolio of unbelievably awesome glass works. Katherine of Jellybean Minis make perfectly tiny dollhouse treasures. These miniscule works of art can also be featured in a shadow box, terrarium, scrap book, or hung on your holiday tree to remember a special moment in time. When you’re Thumbelina, even the smallest gust of wind can feel like a hurricane. This teeny hurricane oil lamp is an essential accessory for any emergency-conscious dollhouse owner. Crafted with a real glass globe, a white ceramic base, and silver accents, this sub-inch lamp can lend an air of elegance to those miniature tables and hutches. Imagine tiny toddlers in a compact dollhouse – then imagine how small their toys must be! 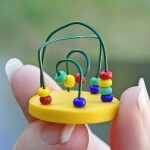 This toy bead maze is a colorful and interactive accessory for a miniature kid’s room. The beads actually move around on the wires, though you might need tweezers and a magnifying glass to play with this inch-tall micro-toy. Laura of The Book Cellar fixes and preserves books in her day job. She brings her love of books home to create tiny book jewelry and charms. The books are authentically made with hand-sewn signatures, leather covers and real blank pages to write in. 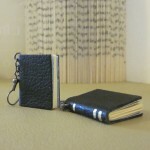 This stunning leather journal necklace comes with 48 blank pages to jot down quotes, poems and wishes. 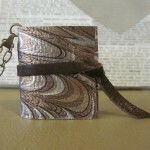 The marbled leather cover has brown and gray tones to match a variety of outfits. The necklace is hung on an antique brass colored chain. With marbled paper end sheets and hand-painted spines, these tiny book earrings are so true to life that bibliophiles will be breaking out their bifocals to take a closer look. Laura’s tiny books can be found in book stores from Oregon to Nashville, so keep your eyes open. Or better yet, take a peek at all of her delightful makings in her Etsy shop. Anne-May and Sophie Mari of Le Petit Cafè are a mother and daughter duo based in Stavanger, Norway who make microscopic meals that look delicious enough to eat. The foodie in your life can choose to adorn a necklace, ring, earrings or cufflinks with their favorite delicacy. 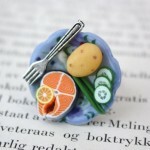 Take your dinner to go with this dinner plate ring; salmon, potato, cucumber and leek adorn a plate less than one inch across. The salmon steak measures less than half an inch wide but manages to look just like the real thing with stripes of fat and bone. It even comes with a slice of lemon, just as if it were being served at my favorite restaurant. 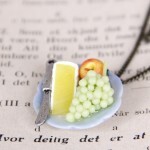 Brie and fruit make a great pairing on this cheese platter necklace. Take a look at the coloring on the microscopic apple – it looks positively scrumptious. This necklace could make quite a statement at your next wine tasting. Maiken and Siri make tasteful and miniature “home-cooked” jewelry and accessories in their Tiny Tasty Etsy shop. Ranging from coffee to dessert, the shop offers a veritable five-course micro-meal that won’t blow your calorie count. 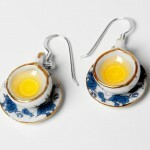 Have a spot of tea with these blue teacup earrings, complete with lemon slices. The miniature teacups are just under half an inch and feature a blue floral design with a razor-thin copper accent on the edge. The perfect gift for tea lovers or collectors of cups and saucers. 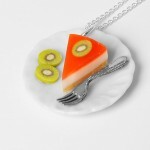 This tropical cheesecake necklace shows off some culinary skill with a crust and guava topping. The tiny kiwis are less than a quarter inch round and still feature their distinctive seeds and core. Nearly anything can be made miniature with the help of eagle-eyed artisans on Etsy. This sampling of adorable items is only the tip of the iceberg – although I can’t promise that I didn’t buy up everything else. If you need a gift tag for any of these micro-wares, my own line of itty-bitty cards will match the theme.